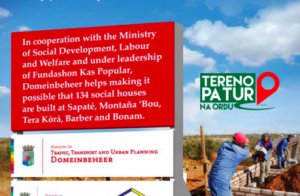 WILLEMSTAD - The first 100 people on the waiting list for a parcel of land have finally received one. The Ministry in charge of Spatial Planning is working on getting rid of the backlog. There are 3000 people waiting for a parcel of land to be allocated to them to build their own house. The condition is that they have to get funding and start construction within 6 months. This year another 500 sites will be released.